Meet Gemma Merryfield, the in-charge of the "Puddleducks Playgroup". The book starts with a typical day at the playgroup. There are anxious parents who worries whether their kids would be fine at the play school, there are late parents- who are never in time to drop their children at the play school and then there is a celebrity Mum who isn't quite what she seems. And then there are these kids, some excited, some cranky and some shy and their 101 questions about everything they can think of, which Gemma and her assistants tries their best to handle. Gemma loves her job but behind her happy demeanor, she is hiding a secret- a secret that only few close ones know about. Soon, it would change her life. But, what it is? Apart from her personal problems, Gemma has Joe Balls to work with and share a bathroom with! Joe Balls, the former- banker- turned teacher has a few surprises of his own. He thinks Puddleducks put too much emphasis on fun and games, and not enough on numbers. They do not see eye to eye in most matters, but when one of the children falls dangerously ill and another disappears, Gemma and Joe have to set aside their differences and work together. It is not all fun and games at 'The Playgroup'. If one has small children, I guess they would be able to relate to the story more. As for me, I did enjoy reading it, yet I would have liked it more, had it been 50-70 pages shorter. The second half of the book was more happening than the first half. In fact, for the first 100 pages it was all about kids and the play group which was kind of too much for me. Yet, it was a fun and light read with balanced elements of humour, romance, suspense and fun. The writing style is simple and yet keeps you interested. There is always some suspense to keep you glued and keep wondering what would happen next. It dwells on a number of parents-kids issues, from raising kids - the naughty ones and the shy ones to nurturing an ill kid, the decisions often mothers take about their career when raising a kid and how a kid can make or break a relationship. There is also the right amount of romance if all the kid's thing is too much for you. 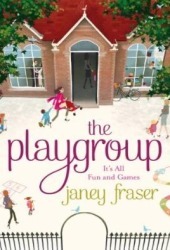 Janey Fraser is the pen name of Jane Bidder. She is a journalist and a writer and has written five books under the name of Sophie King. To know more about the author and her works visit the links below.